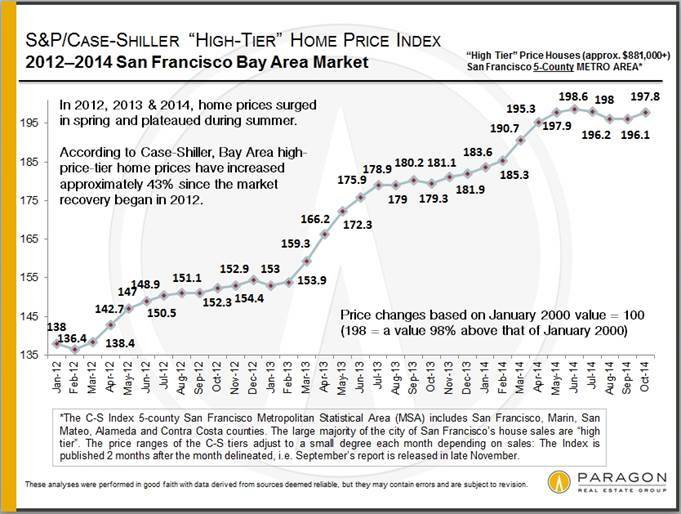 For the last time this year, the Case-Shiller Index for the San Francisco Metro Area has been issued. Paragon has written up its own take on the matter. Remember, the index is published two months after the fact and reflects a three-month rolling average, so this time around it reflects the index for October and is not completely current. The index covers the housing markets of five Bay Area counties, divided into three price tiers, each constituting a third of unit sales. 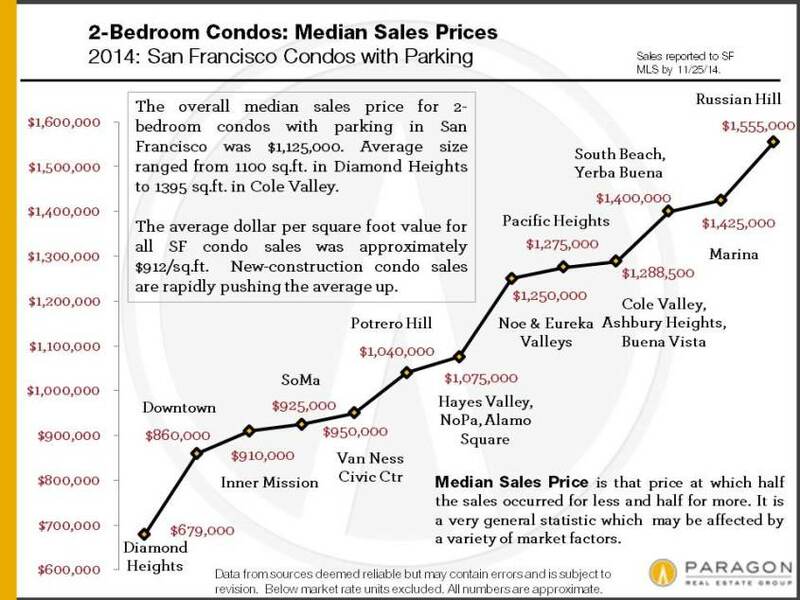 The majority of San Francisco’s housing stock lies in the high-price tier, so that is where we at Paragon focus most of our attention. 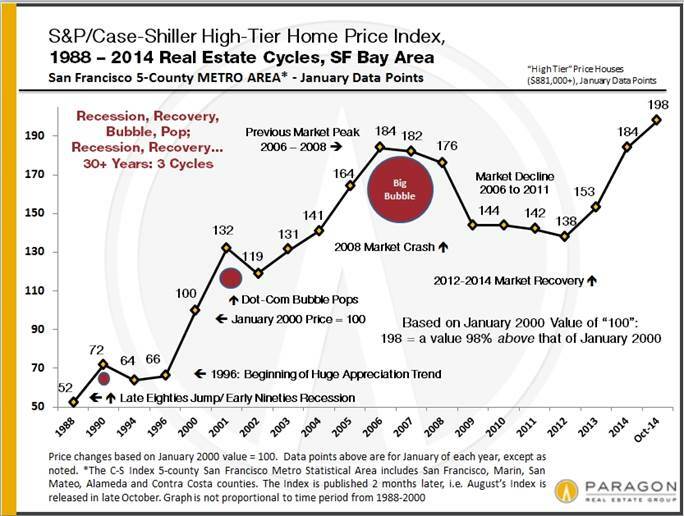 The first two charts that accompany this article are illustrative of the price recovery of the Bay Area’s high-price-tier market over the past year as well as since the beginning of 2012, when the market recovery really began in earnest. Home prices jumped in the spring and then plateaued in the summer and autumn months in both 2012 and 2013. Spring 2013 saw a particularly dramatic surge in spring, which reflects a frenzied market of huge buyer demand as well as historically low interest rates, extremely low inventory and increasing consumer confidence. The current Case-Shiller report begins to reflect the autumn selling season, which begins just after Labor Day. Typically, we see the market heat up in autumn. Following a feverish spring market, the high-priced tier and then flattened and ticked down a little. Meanwhile, more affordable home segments continued to tick up. That’s not unusual. According to the index, all Bay Area home price segments went up in October by about 1 percent, plus or minus depending on segment. Keep in mind that small monthly fluctuations aren’t what’s important – it’s the long term that counts. Looking for specific answers to your real estate needs? Get in touch. We’re on the cusp of the calendar flipping to a new year. 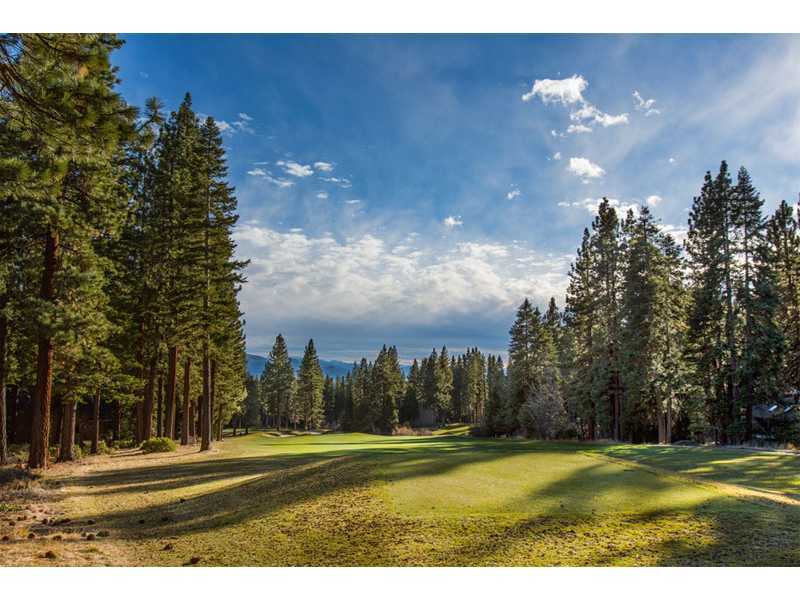 What will 2015 bring to the real estate market? The National Association of Realtors offers five predictions for the coming year. Let’s give them a look, shall we? 2) Millennials are beginning to buy. Those young folk born between 1981 and 2000 are starting to emerge as homebuyers – and, in fact, according to NAR about 65 percent of first-time buyers are in the older millennial group aged 25 to 34. Of those who are buying, an estimated 86 percent are doing so because of a change in family size. 3) Builders will get busy. Smoke said in a statement that housing starts are in a position to pick up the pace and shift in focus. “We are forecasting 16 percent growth in starts, driven now more by growth in single-family starts, which we are expecting to grow 21 percent,” he said. However, single-family construction will be limited by shortages of materials and labor. 4) Credit remains a consideration. Many consumers, particularly younger ones, are prevented from buying a home with a bank loan due to strict qualification standards. 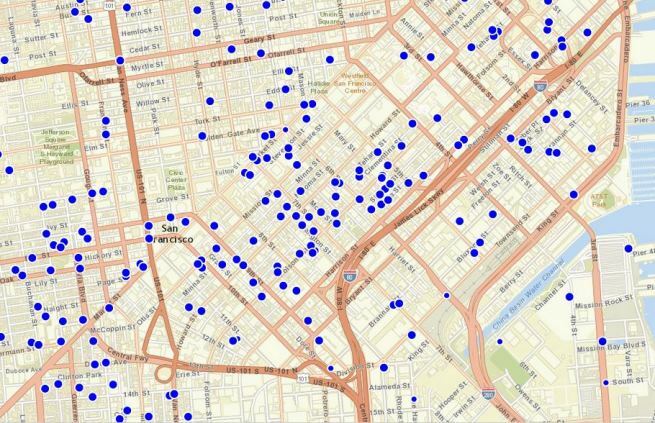 The housing market may find itself constrained by this lack of access. 5) The foreclosure crisis is at its end. Foreclosures skyrocketed seven years ago with the burst of the housing bubble, but we’re looking to close that out in 2015, with local variations by area. Christmas is almost here – how do I decorate? If you’re the procrastinating type, you may not be overjoyed to realize that today is Christmas Eve and you still haven’t gussied up your home for the holidays. Fear not. HomeDIT has a few tips for you to make your home beautiful just in the (Saint) Nick of time. First off, consider including your favorite colors. Why stick with red and green? Skip that and instead try something different when it comes to dressing your Christmas tree. Even if your favorite colors aren’t at all related to the holidays, they will likely make the tree fit better into your home’s decoration. HomeDIT offers violet as one option and turquoise with green accents as another, but you can certainly come up with whatever works for you. Try accessorizing color accents with others used throughout the room. This will create a harmonious blend and help the tree fit in wonderfully. Second, try playing with shapes and proportions. Make the most of what you have in order to invite the holiday spirit into your home. Make sure the tree fits the room. For example, if you have a low ceiling and not a lot of breathing room, a small Christmas tree will fit the place in a cute, perfect way. Try decorating it with large ornaments as a way of playing with proportions. Third, take a hint from Scandinavian interior design – and adapt these to your decoration of the Christmas tree. In Scandinavian design, simplicity is everything. That means ditching the sparkly colors and ornaments and instead incorporating white and natural materials. Try also playing with texture and design to adapt the tree to its environment. 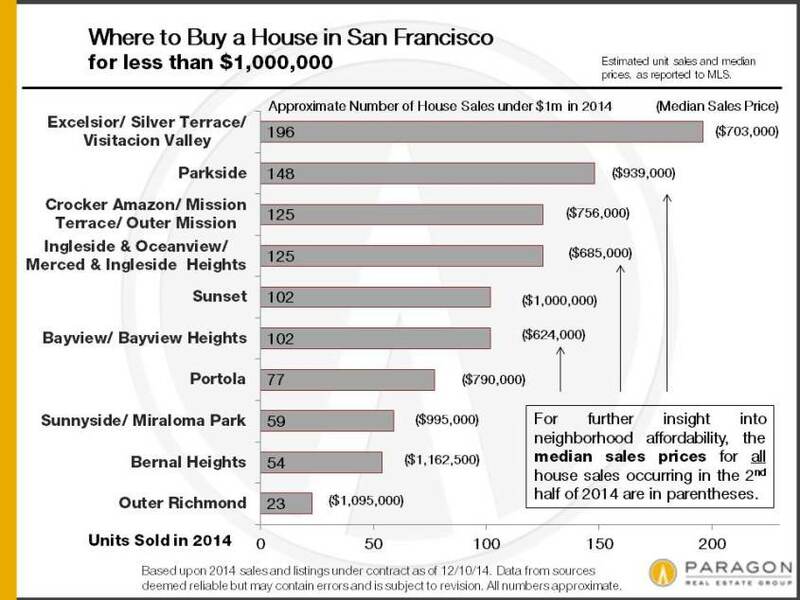 What did San Francisco homebuyers purchase in 2014? 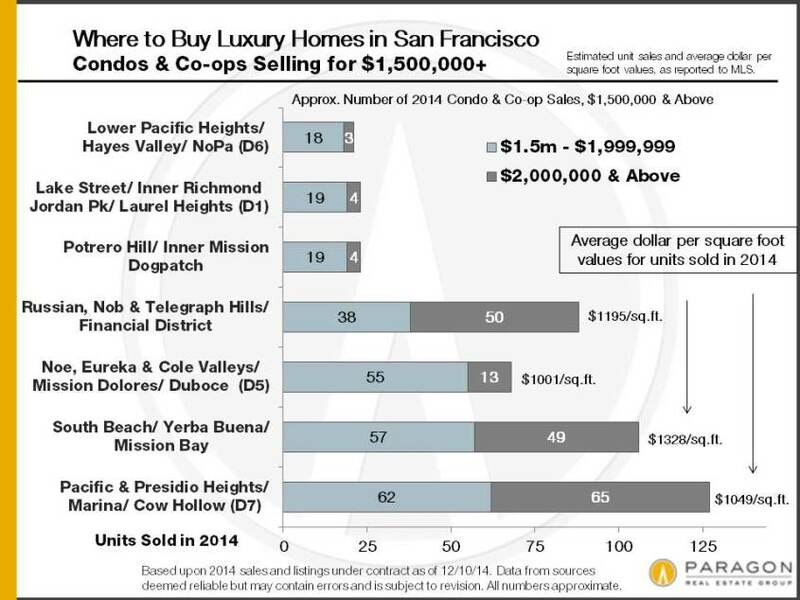 Paragon has released a year-end report titled “Penthouses, Probates, Lofts, Mansions and Fixer-Uppers: What San Francisco Homebuyers Bought in 2014.” Accompanying this story are a slew of charts used to illustrate Paragon’s findings. To see more, check out the report itself. 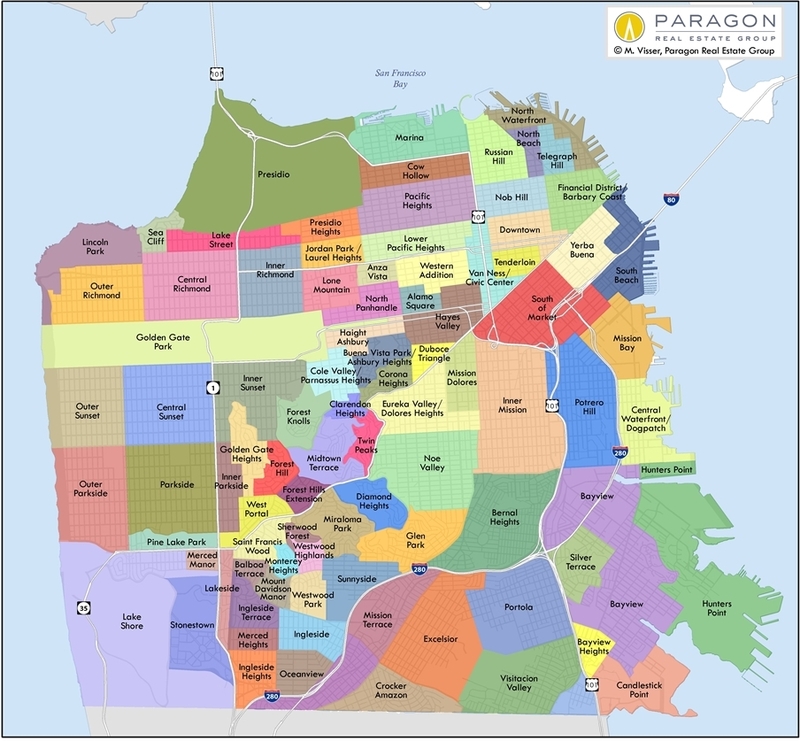 Some Realtor districts contain neighborhoods that are relatively homogeneous in general home values, such as Districts 5 and 7, and others contain neighborhoods of wildly different values, such as District 8, which includes both Russian Hill and the Tenderloin. 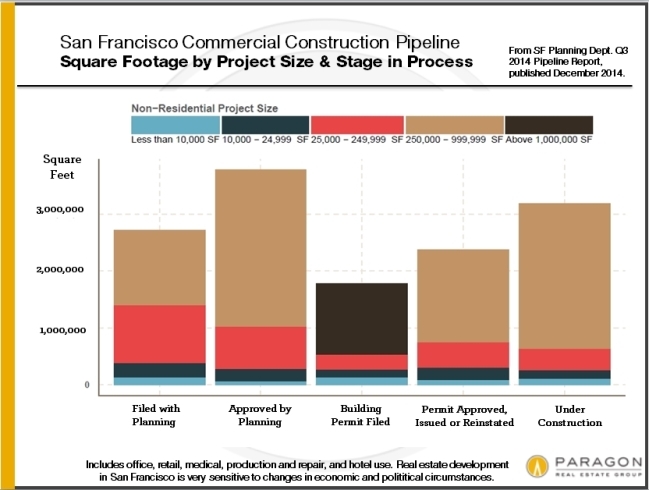 Paragon has analyzed the new 36-page San Francisco Planning Department’s third-quarter pipeline report for both residential and commercial projects and have produced a “Highlights” report of our own. Something to keep in mind: the construction pipeline includes projects in every stage of the approvals, permits and construction process. Being listed there doesn’t indicate when or even if a given project will reach completion, since changes and additions to the pipeline are ongoing. Big projects are seemingly an everyday announcement lately; economic and political changes alike can also have huge impacts. The current pipeline includes 50,600 residential units: condos, houses and apartments as well as affordable and social-project housing. Far less than 1 percent of the pipeline is made up of houses. In addition, 18.7 million square feet of commercial space are in the pipeline. This includes office, retail, medical, hospitality, cultural and institutional uses. Of that amount, 12 million square feet are for office use. 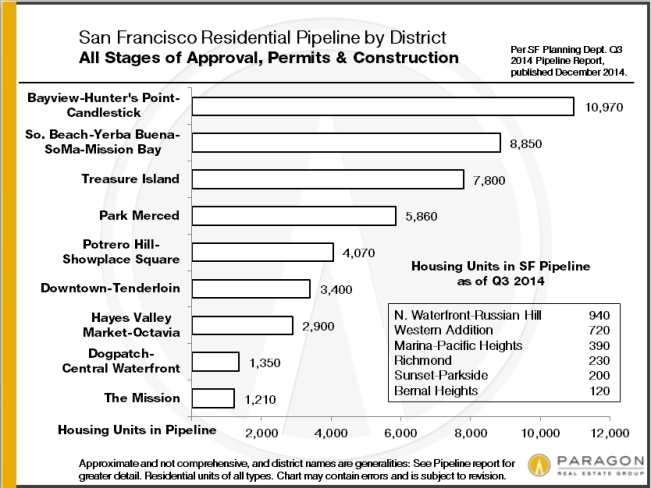 The past year has seen 3090 residential units and 280,000 square feet of commercial space added to the pipeline. For these projects, median time to completion from first filing was 43 months. Smaller projects of less than 10,000 square feet saw median times drop to 30 months. Currently under construction are 6700 new residential units and 5.4 million square feet of commercial space. 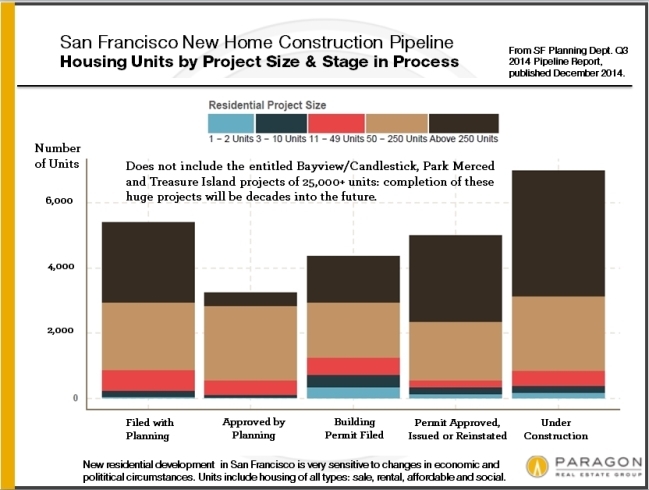 A little more than 25,000 of the pipeline’s residential units are comprised of the Bayview/Hunter’s Point Candlestick, ParkMerced and Treasure Island projects. 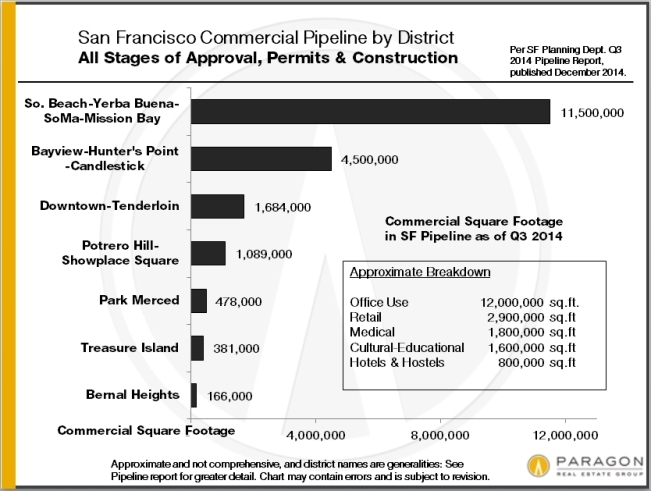 Most of the rest of the residential as well as commercial pipeline projects are clustered in the greater South Beach/South of Market/Mission Bay areas as well as the Market Street corridor, Potrero Hill/Dogpatch area and the Mission District. Existing pipeline development threatens approximately 800,000 square feet of manufacturing, distribution and repair use space. 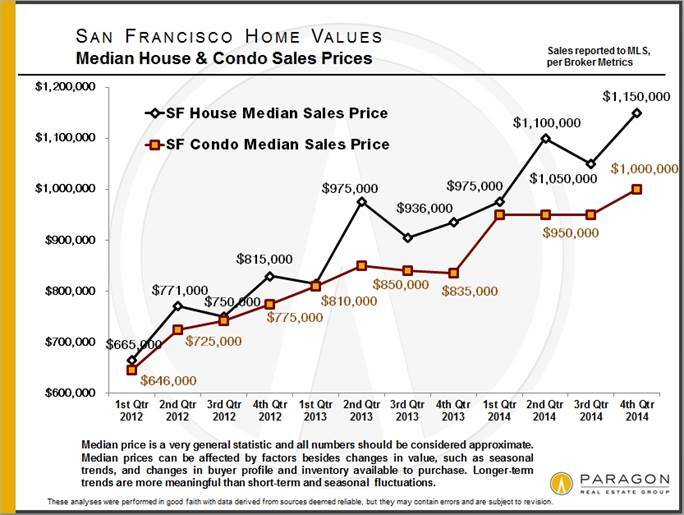 To a large degree, if you’re buying a house in San Francisco, your price range effectively determines the possible neighborhoods to consider. That does not apply quite as much to condos and TICs: Generally speaking, in neighborhoods with high numbers of condo and TIC sales, there are buying options at a wide range of price points, though, obviously, size, quality, view and amenity considerations will come into play. 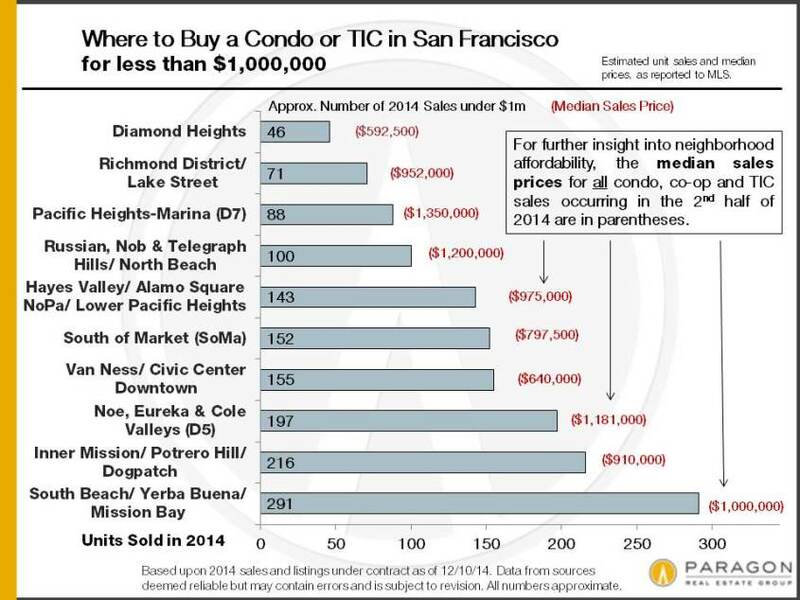 Where to buy a home for less than $1 million in San Francisco. The horizontal columns reflect the number of sales under $1m in 2014 for each area, while the median sales prices noted — to be as current as possible — are for all house sales in each area in the second half of the year. 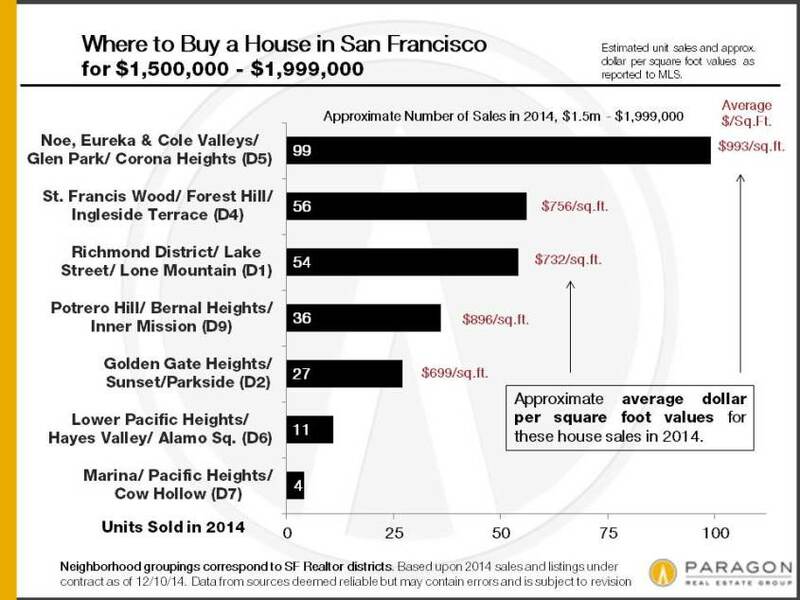 Where to buy a home between $1 million and $1.5 million in San Francisco. The horizontal columns reflect the number of sales in each area, while the dollar amounts reflect average dollar per square foot values for the homes in this price range of the specified areas. 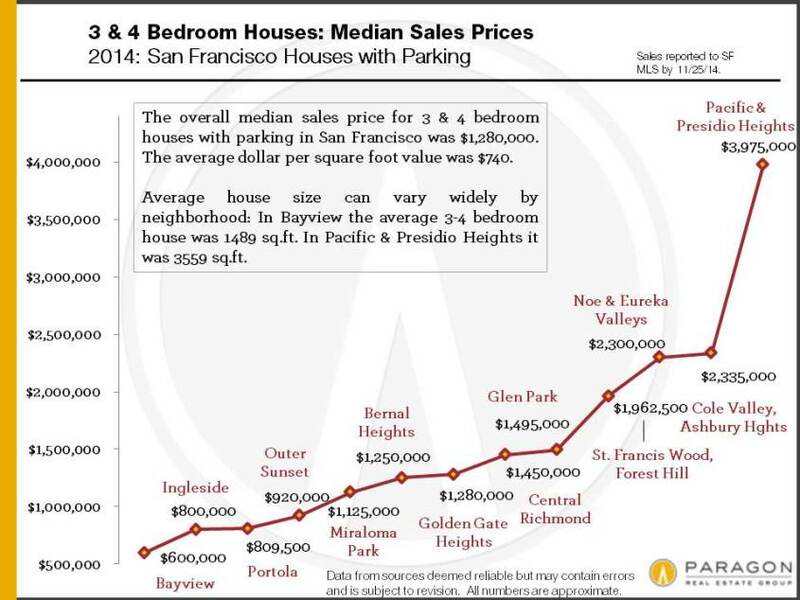 House sales in San Francisco. 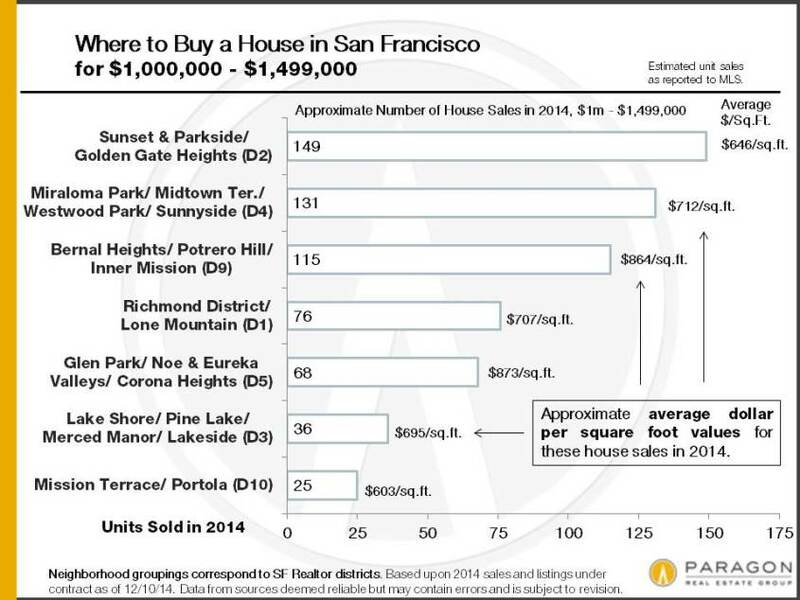 Where to buy a house (as in, regular old house) between $1.5 million and $2 million in San Francisco. 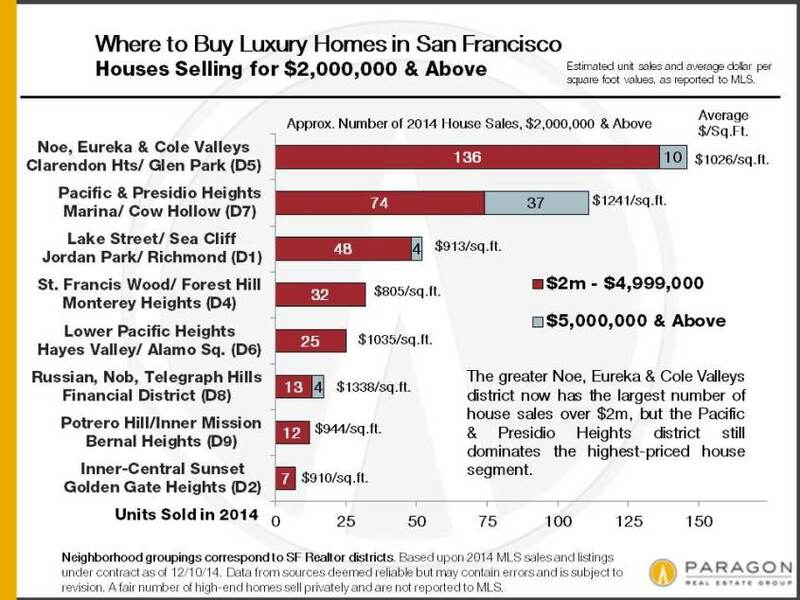 Where to buy a luxury house in San Francisco. 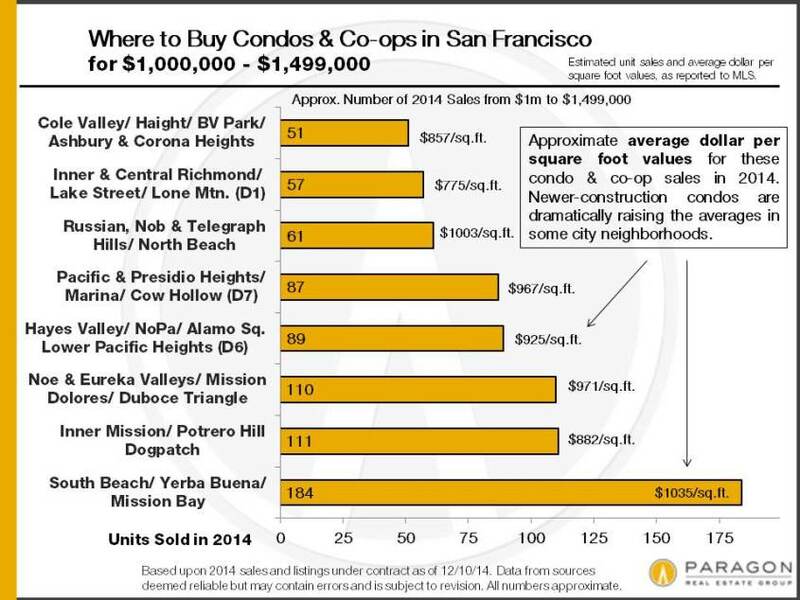 For the sake of this report, houses selling for $2 million and above, and condos, co-ops and TICs selling for $1.5 million and above are designated as luxury home sales. What you get in different neighborhoods for $2 million can vary widely; a large, gorgeous, immaculate house in one place, a fixer-upper in another.